When you think of The Alps, the activities that spring to mind would usually be Skiing, Paragliding, Climbing or Hiking. But what about Ballooning?! Wouldn’t it be amazing if you could fly over the Alps and enjoy a 360’ uninterrupted view, spotting skiers and wildlife along the way? Well, you can! Next week, Château d’Oex plays host to the 38th International Balloon Festival! 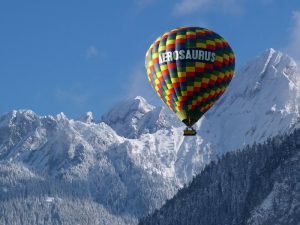 The setting is a small village high up in the Swiss Alps and the fiesta is attended by 80 balloons with pilots coming from all over the world. Aerosaurus Balloons Directors Clive and Jo Bailey will be there to Pilot the Bristol 2015 Green Capital first ever passenger carrying solar Balloon! The Solar Balloon is a hybrid, meaning that it is powered by the sun as well as gas burners. Funded by Bristol 2015 to mark the city’s status as the European Green Capital, the balloon was manufactured by Cameron Balloons in Bristol and took its maiden flight at the 2015 Bristol International Fiesta piloted by Aerosaurus & Bailey Balloons Pilot Pete Dalby, who will be joining Jo & Clive in Switzerland. The balloon works by soaking up the sun’s rays on the side with the black material, heating the air inside the envelope to make it rise. The silver material keeps the heat inside the envelope. It does have a traditional burner as backup. 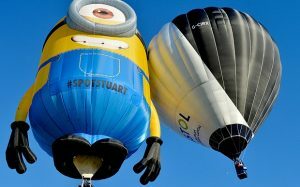 Pete only had to use the burner a handful of times during the first flight – the first time being when Stuart the Minion got in the way of the sun and the balloon started to descend! Jo & Clive are regular participants of the Château d’Oex Festival and have taken many flights across the awe inspiring Alps. The 2016 Festival runs from 23rd – 31st January. Mass ascents with over 100 balloons taking part is certainly a sight to see. Skiers will enjoy bright blue skies filled with colourful balloons drifting over snowcapped peaks and there will also be night glows and air shows.